In my firearms collection I have a 30+ year old Smith & Wesson Model 28 Highway Patrolman .357 magnum. 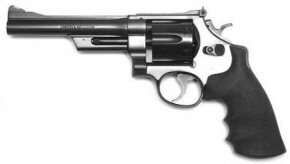 Smith & Wesson built the Highway Patrolman on their .44 magnum N frame making it beefier for handling higher-pressure loads. This gun was built for law enforcement use, and was really a less expensive version of the highly polished target model 27. I no longer shoot this gun and decided to sell it to a friend. I may regret this decision later, but I have other uses in mind for the money. I had packed the gun into a padded gun rug and was in the process of bringing it to my friend’s house, when I dropped it onto the cement floor of my garage! It was raining that day and I was juggling the gun, an umbrella, car keys and alarm fob, and the gun rug slipped out of my hand. I took the gun out of the rug and couldn’t find any outward evidence of the drop. But, when I tried to cycle the action, the cylinder jammed. When I opened the cylinder I noticed the center pin was stuck in the unlock position. I took the gun into my shop, removed the yoke screw (the frame screw closest to the barrel), and removed the yoke and cylinder assembly from the frame. I removed the cylinder assembly from the yoke and placed it into a padded vise with the extractor rod up. I wrapped a piece of leather around the extractor rod, and using pliers, rotated it clockwise to unscrew the rod. 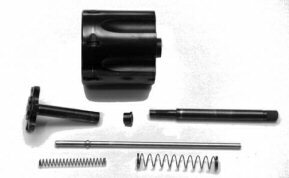 Yes, this has a left-handed thread, so normal cylinder rotation will have a tendency to tighten the rod to prevent it from coming loose. When I removed all of the parts from the cylinder assembly, I found I could not remove the center pin. I had to use a punch to push it out. Upon closer examination, I found the end of the center pin had been displaced 0.005” causing it be off-center. Apparently, this happened because the revolver landed on the cylinder with enough force to cause the center pin to be displaced where it entered the recess in the frame. Now that this was off-center, the cylinder did not rotate evenly and would jam. I checked to see if any other parts were damaged, including the recess in the frame, but all seemed to be ok. I ordered a new center pin, part number 940-072-750 from Brownells, which arrived a couple of days later. I reassembled the cylinder and again used a padded vise and leather to make sure the extractor rod was nice and tight. I reassembled the gun and found that the new center pin was too long, which would not allow the cylinder to close. I used my high-speed rotary tool with a cut-off wheel and removed about 1/8” from the end of the pin. It now fit correctly. With the gun reassembled, I cycled the action and checked for proper cylinder alignment with the barrel by using a dowel rod. Everything seemed to work well, and the cylinder aligned properly with the barrel. So, for the price of parts and postage, I was able to repair the revolver myself. I sold the revolver to my friend, who seems pleased with his purchase. This was an easy fix, but I had to remember that the extractor rod had a left-hand thread.